Bengal cat gifts are great choice for people who love exotic cats. Indeed, if you (or someone you know) love these leopard-looking felines, you will enjoy giving and receiving gifts inspired by them. Not sure about what to give? Here you will find a few suggestions to help you get started. The Bengal is a relatively new hybrid cat breed. It is the result of cross breeding a domestic cat with an Asian Leopard Cat. Bengal cats have a strong, muscular body type and distinctive markings. These unique spots gives them their wild appearance. Despite his looks, the Bengal is a mild mannered, social and intelligent cat, which makes him a great house pet. 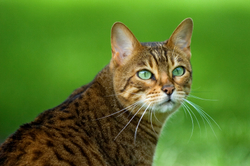 To learn more about the Bengal cat, check out this article. Do you love these beautiful spotted felines? Then you'll love these gifts ideas. Most are inexpensive and are great to celebrate any occasion. sell your artwork online at Zazzle. Become a artwork affiliate for Zazzle. Learn how to sell your art online at Zazzle. There are several items that celebrate the beauty and uniqueness of the Bengal cat. You will find stuff for the home, including kitchen accessories, aprons, mugs, and much more. You will also find some nice collectibles. Need some ideas? Here are a few. Curious about Bengal cat behavior? Bengals of the fourth generation and beyond are sweet-tempered, affectionate and very friendly cats. Di you know that Bengals were officially developed during the 1960s? Want to learn about the history of these amazing felines? There are a few good books on the subject. -- The Guide to Owning a Bengal Cat: History, Character, Breeding, Showing, Health by Jean S. Mill – Authored by the creator of the Bengal cat breed, this tome is filled with lots of authoritative information on the Bengal. -- Bengal Cats (Barron's Complete Pet Owner's Manuals) by Dan Rice – Useful advice and information for Bengal cat owners. -- Getting to Know the Bengal Cat by Gene Johnson – A guide book to help you understand this beautiful cat. If you have a small budget, you can still give a unique Bengal cat gift. Inexpensive gift ideas include Bengal-themed calendars, mugs, and key chains. These make great gifts for cat lovers of all ages. If you've just adopted a Bengal cat or kitten and are looking for a unique name, check the Bengal cat names page, here. Note: The items presented here have been brought to you in association with like zazzle.com and Amazon.com .